We had around 2500 visitors and the majority of our exhibitors reported it to be their busiest Apple Day ever. The weather was kind to us – not too hot in the tunnels and glasshouses, not cold outside. We were particularly delighted at the large numbers of visitors who had never been to Kehelland before, or to our Apple Day; their positive reactions to the event, the site and to the work that we do here on a daily basis were a joy to hear. We were overwhelmed with people wanting to talk about their own apple trees and orchards; we had some success with identification but we hastened to show people our interesting fact that ‘you could eat a different apple every day for 6 years and still not have tried all the apples growing in this country’ – there’s a lot of apple varieties out there and a lot of unknown/ unnamed seedlings! We enjoyed sharing in the process of taste comparisons and cutting apples open to compare pip structure. One family were excited to discover that when they cut their apple across the girth, the core was a perfect 5-pointed star – they went on to take a print of it in our apple printing workshop. One gentleman went home happy when he tasted a variety of apple – Ribston Pippin – that he hadn’t tasted for over 50 years. It is moments like this that never cease to make our Apple Days extraordinary. Added to that, the large numbers of visitors have meant that – as a fund-raising venture – it has been more successful than ever before. We are seeking funding for a new tractor on site to help us manage the 16 acres. It is both impossible to do this without the use of a tractor mower and topper, but we are losing a valuable and positive experience for our trainees when we don’t have one. Individuals we work with may have no other opportunities in their lives to drive a vehicle like this and the benefits are excellent; they also learn about vehicle maintenance and servicing. We are going to be a few thousand pounds along road to funding the tractor after Apple Day. Thanks to all those visiting us on Apple Day, the exhibitors, performers, our staff, trainees and carers for making this happen. Camborne Produce Market upped sticks for the day and set up on our site – a perfect compliment to our caterers – Hidden Kitchen and Dining’s chefs who served seafood paella and Sri Lankan Curry, Bus Fayre served burgers, our own apples in pork and apple sausages, wraps and paninis and Truly Crumptious alongside our own café and bar serving St. Ives and Helford Creek Cyder and St. Ives brewery ale and lager. There were many musical highlights from Red River Singers, Celtic Fiddlers, Newquay Hornets, Pensamba – who led the procession to the orchard where followed a flash mob dance to Katy Perry’s ‘Roar’ led by Ruthie who runs fitness sessions at Kehelland on a weekly basis. The dance – first choreographed by Becci Gowers was performed in Truro for Down Syndrome Awareness week in March. As October is Down Syndrome Awareness month – we wanted to recreate the flash mob in our orchard for apple day. We were joined by children of Kehelland School and it was stunning! MacQuarrie and Toms rounded off the day by playing us through until 5 with foot tapping and ingenious folk music – a mix of their own tunes and traditional ones. some lovely photos were taken by Aimmee/John Memories – Photography. These will be posted here soon. In the meantime, have a look at our Facebook Page and please share any of your own memories of Apple Day with us! 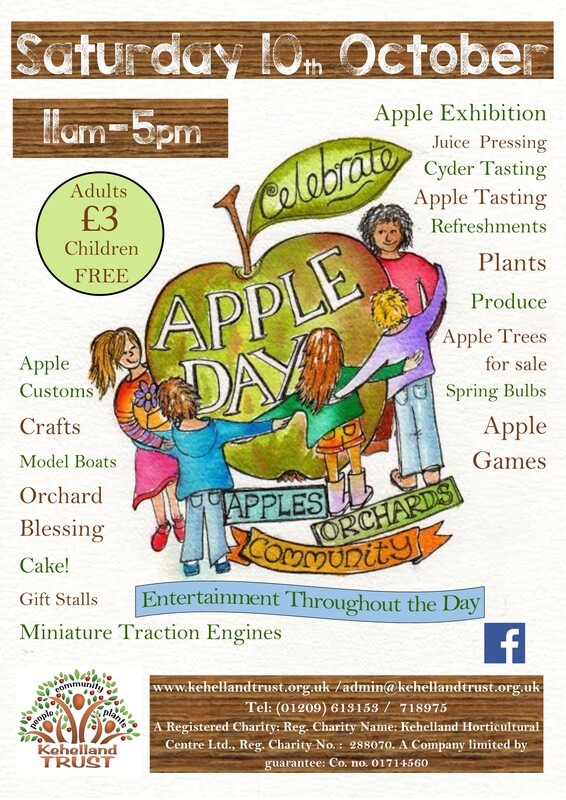 Golly how time rushes by and Apple day is almost upon you 2015! William and myself are hoping you need help again, if so we are both offering ourselves as usual to do anything you require!! Many thanks for getting in touch and sorry for delay in replying. 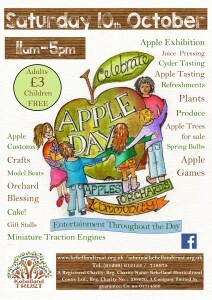 we have our apple day countdown meeting this afternoon and volunteers will be on it. We will certainly be in touch in the next few days. I was enquiring if you have any stalls still available for ‘Apple Day’ this year. I have only just discovered that it is on early next month and was hoping that you may still have something available. I make and sell children’s fleece tops and buy and sell children’s clothing as well. I have been let down on a few events recently so I am hopeful that you may have something. I’m really sorry, but bookings have now closed for this years stalls and we are full to capacity. Please do keep in touch for next year on the email sale@kehellandtrust.org.uk and we will forward booking forms. I have put you on our mailing list, so please do tell us if your contact details or the item descriptions change.